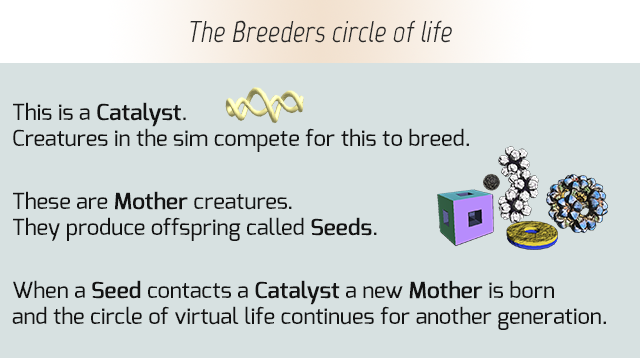 Breeders is an ecosystem filled with strange flora and fauna. It's a sandbox for exploring emergent behaviours and tinkering with the complex systems that can arise from simple rules. Every critter in the simulation has just one goal: breed. Each species tries to accomplish this goal in its own way but they all compete for the same vital resource - the Catalyst. Instead of moving with muscles and bones the creatures roll, hop, and bounce using invisible bursts of force. Instead of eating they absorb energy from light. Instead of eyes and ears they have sensors to detect Catalyst and predators. Some creatures have no senses at all and must rely on random chance and physical reactions to survive. Sound strange? It is. Strange and wonderful. (^_^) Watching the simulation is like peeking into an alien world teeming with life. Learn more about Breeders at BrainBlinks.com. I released the first version of the sim in July of 2011. This was my very first Unity project so it was a little rough around the edges - but a great proof of concept. I was encouraged and a little overwhelmed by the response this received, especially after it showed up on the Gaming subReddit page. Thousands of people playing and dozens of them offering advice and suggestions. My ideas for future versions of the game quickly grew beyond my skills so I took a break to gather my thoughts and build my code-fu. I did create a couple more versions of the sim over the next few years, but none were as much fun as the original. So here is the original Breeders, retrofitted with VR. The sim is pretty much as it was in 2011, with just a few changes to accommodate the newer version of the game engine (Unity). Sadly, the ferocious Leopard Amoeba didn't survive the transition. It's crude and unoptimized - but still a lot of fun to tinker with. You move around the scene using some simple, zero-G controls. There are a few scenes to choose from. Just move onto one of the colored, translucent transporter pads to go to another scene. No sound effects in this version. I don't plan on making too many additions or changes to this app but there are a few things I'd like to do. I'd especially like to add a better way to select which critters to spawn and maybe a few more areas to use for your experiments. Works with Rift+Touch and HTC VIve using SteamVR. Thanks Skydjinn. I probably won't be improving this specific version of Breeders, it is just too janky. I've learned a lot about Unity and coding since making this. I may work on something similar in the future, though. Well, good luck with whatever you do. The idea still has potential for something fun.